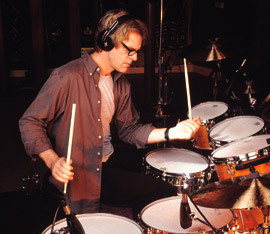 Stewart Copeland, drummer for The Police and leading film composer (Wall Street, Pecker, many others) as well composer for ballet and opera, talks to Inside Mac Radio's Scott Shepard in an interview posted today. [ Show notes and downloadable MP3 ] Copeland was a keynote speaker at the O'Reilly Mac OS X Conference, an appearance I wrote up for the February Keyboard Magazine. told the crowd at O'Reilly he's moved to computer-programmed beats.